James Murdoch's day of evidence has raised serious questions for ministers, including claims - based on emails revealed to the Inquiry - that Culture Secretary Jeremy Hunt acted as a "cheerleader" for News Corporation's bid for the 61% of BSkyB shares it didn't own. Labour has called for Mr Hunt's resignation. The internal News Corp emails - detailing phone calls between Mr Murdoch and Mr Hunt and regular contacts between News Corp's public affairs director, Frederic Michel, and Mr Hunt's special adviser, Adam Smith - overshadowed the issue of phone hacking, which had previously dominated the Leveson Inquiry, and which ultimately led News Corp to abandon the bid. Pulling the threads together, Robert Jay QC suggested that Mr Hunt's backing for the BSkyB bid had been a quid pro quo for the Sun newspaper's support of the Tories at the last election. "Absolutely not," said Mr Murdoch. It was one of the most dramatic days so far in the long drawn-out inquiry - and it heralds several more, as Jeremy Hunt, David Cameron and other cabinet ministers are called to give evidence. 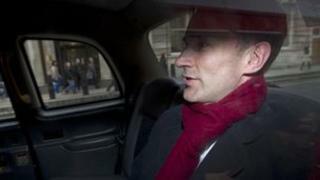 A source close to Mr Hunt has said he will make his case at the inquiry, maintaining that the BSkyB bid process was very rigorous and there was "nothing inappropriate" in the dialogue between his adviser and Mr Michel. Yet Mr Murdoch's five hours of testimony to Lord Justice Leveson also highlighted the sharp contrast between his hands-off attitude over phonehacking at the News of the World and his hands-on role in the News Corp bid for BSkyB, in which he was constantly seeking to make his case to ministers. For the first hour or so, questioned closely about the phone-hacking scandal, James Murdoch was wary and subdued, seemingly semi-detached from events at News International, the UK newspaper arm of his father's global empire. Yet after the morning break, when questioning turned to BSkyB and its relations with the government, we saw a different James Murdoch, very much in command of a business he was passionate about. Whether lobbying over TV football rights or the proposed deal to let News Corp buy all the shares in BSkyB, he was clearly at the centre of things. The difference was noted by the former TV and newspaper mogul Lord Hollick, who tweeted: "At Sky, Murdoch master of the detail, intimately involved in all key decisions. Stark contrast with ignorance and detachment at NI." It raises the question as to what would have happened if James Murdoch had taken the same forceful action over phone hacking as he did over BSkyB's affairs. Unlike Rupert, James was never a newspaper man. Even when he was made chairman of the company (just as the full scale of the phone-hacking scandal was emerging), he didn't embrace the sometimes grubby world of tabloid papers. He told the inquiry, in effect, that he'd left it to the News of the World's editor and legal manager to clear up the mess, and they had not made it clear to him what was really going on. As in his earlier evidence to MPs on the Culture Media and Sport Select Committee, Mr Murdoch denied being told the significance of the "For Neville" email, which showed that phone hacking was not the work of 'one rogue reporter' as the company had maintained. He said again that he hadn't read down the email chain that would have made this clear. The inquiry also heard that he hadn't inquired too closely, even when News International faced paying hundreds of thousands of pounds in damages and legal costs to Gordon Taylor of the Professional Footballers' Association and the PR expert Max Clifford. Either it was a cover-up or it was a failure of governance at the company, suggested Robert Jay QC. It was neither, Mr Murdoch insisted. Lord Justice Leveson expressed surprise at the company chairman's apparent lack of interest: "Did you not ask: 'How did this happen? Why didn't we pick it up? Why didn't we pick this up internally before the police intervened?'" After the break, the contrast between the hands-off James Murdoch and the hands-on James Murdoch became apparent. And now it's his father's turn to give evidence.